In all our posts complaining about our apartment, I’m surprised that we’ve neglected to mention one of the more humorous problems (if it can be so called) of living where we do. That is to say, all the sounds we’ve become accustomed to. We live in a generally “quiet” part of the city. I say “quiet” because it’s really a relative term. I mean, not all noise is bothersome or annoying anyway. We avoid most of the obnoxious sounds coming from the busier streets in town, luckily, but we cannot escape it all. We tend to get the occassional drunk, student group returning home from a night of partying in the Oude Markt (Old Market, where the bars are). This inebriated lot will often stop outside our building shouting up to their friends on the second or third floor who are hanging out their windows shouting back. One would expect to be bothered occassionally by loud college students in a college town. However, I could never have forseen the issues brought to my attention by living so close to a bowling alley. Yes, we live within a block from a bowling alley. It’s weird. The bowling alley is located behind our building on an adjacent street. We’ve never been inside, but I’m curious to know what it’s like in there. The thing that’s so strange is just how constant (and I mean CONSTANT) the sound of bowling balls rolling and hitting pins is. I mean, SERIOUSLY!? Do Belgians really bowl this much? I am not exaggerating when I say that the sound persists all day and long into the night. Every day. Every night. The sound isn’t really annoying at all unless you think about it. It can actually be kind of soothing at times like the sound of crashing waves on the beach or distant thunder…if the waves were made of bowling balls crashing against a beach covered in bowling pins. I guess we don’t have that much to complain about on that front. Since the Platygator’s appearance last Friday, I’ve gotten a lot of requests for more. 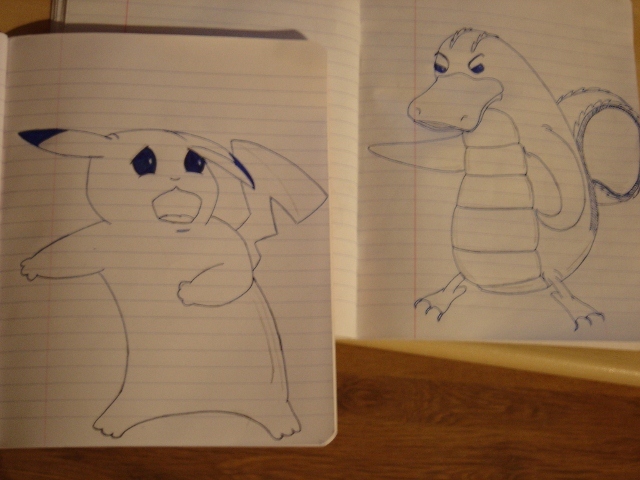 Unfortunately, I don’t have a tablet to draw on or even a scanner to … scan with … so this is what you get: two notebooks photographed with a blurry camera in a poorly lit apartment. I decided to give the little guy an opponent for this post–one who’s newly released video game makes him an ideal target. The lightning rat is going down. Today I stumbled across an article and video from one of my very favorite authors, Neil Gaiman, at ComicsAlliance.com. I’ve seen Gaiman speak in person, heard him read his poetry, purchased it in hardcover, bought entire runs of the comic books he’s written or influenced, and basically attempted to gobble up anything I can which bears his mark. Whether you’re into Science Fiction, Fantasy, or superheroes is sort of irrelevant when it comes to Gaiman. He’s a phenomenal writer, and the worlds he weaves are so deep and engrossing, so lush with character, characters, and insight, that there is no one to whom I would not recommend at least one of his works. Odds are, you’ve seen or read something by him, even if you weren’t aware of it. The movie Coraline, for instance, is an adaptation of a book he wrote as a fairytale for his young daughter. I could go on listing his literary accomplishments, but I’ll leave it to you to look them up. But be warned: it might take a while—they’re many. The Comics Alliance article basically just reposts and explains a comment which Gaiman recently uploaded to YouTube about the nature of piracy and sharing. You might have caught my brief, noncommittal jab against censorship and in favor of piracy in an earlier post, and it was making that comment that led me to link the video and the Comics Alliance article here. It’s worth a look. As part owner and administrator of this blog, I reserve the right to get a little sappy from time to time. So when I say that I made a Valentine’s Day YouTube playlist (the neo-iTunes playlist, which was the neo-mixed cd, which was the neo-mixed tape) for Linds, I don’t want to hear any “uuuugh”ing or “eeeeeeeew”ing from he peanut gallery. This is my pre-wedding adventure, dammit, and if I wanna get sappity and twitterpated on Valentine’s Day, I can. So, baby. Here ya go. Happy Valentine’s Day. Muah! Just click here to be whisked away to the playlist. And look! I made the whole thing without using any Michael Bolton or R. Kelly! That alone is reason to be proud. What do you guys think? Was there anything I left out? What’s on your Valentine’s Day playlist? Hit the comments and share your thoughts. If you’ve gotten to see her already, you know that Linds is back stateside. And just like Linds, our little princess Whitley headed home this week (copycat) from her long stay in Chile. Again, like us (copycat), Whit is by now a pretty accomplished adventurer. I, however, am still in Belgium till Wednesday, when I finally get to head home for a much needed Christmas break. Despite the non-Belgian locale in which my counterpart finds herself, there has been no shortage of adventure on either side of the Atlantic. This is, after all, an (read: the) Adventure Blog, and we, it’s operators, pride ourselves on our adventuring.